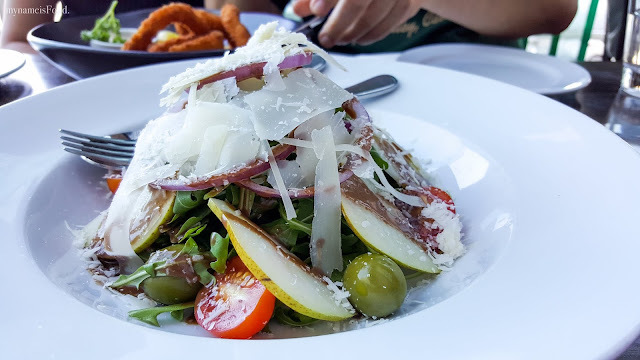 Hurricane's Grill & Bar - Surfers Paradise, Gold Coast - my name is Food. Many may say that this place has the best ribs, but I disagree. It has not yet beaten our favourite ribs place, with its quality, service and consistency. But I have to say that their location definitely provides a nice view and strategic location. 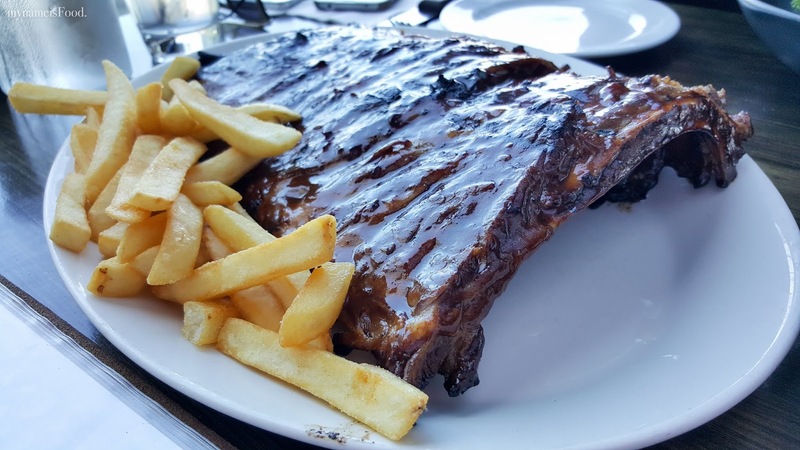 Offering not only pork ribs but also many other items on the menu to cater even the young ones, it is a place for both dates, groups and casual dining. 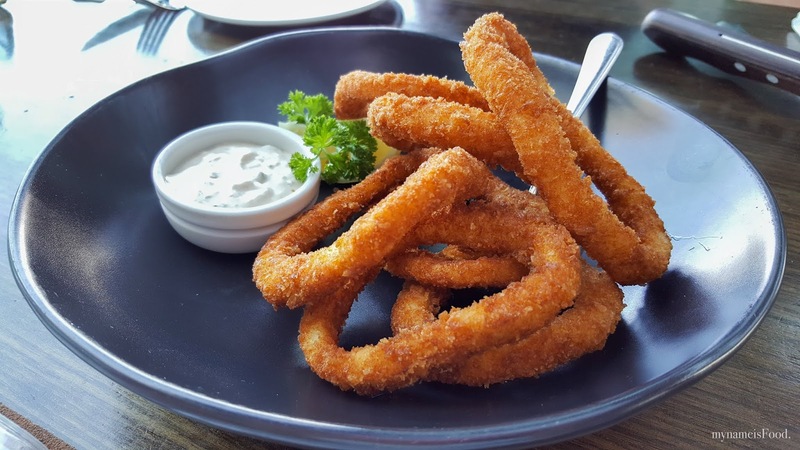 Starting with the 'Fried calamari' served with tartare sauce, about 8-10 pieces of deep fried calamari served with a lemon wedge and a small bowl of tartare sauce. The tartare sauce was not very tangy but did add a good punch and freshness for the calamari. 'Rocket, pear and parmesan salad' served with spanish onion, cherry tomatoes, green olives with a honey mustard dressing. 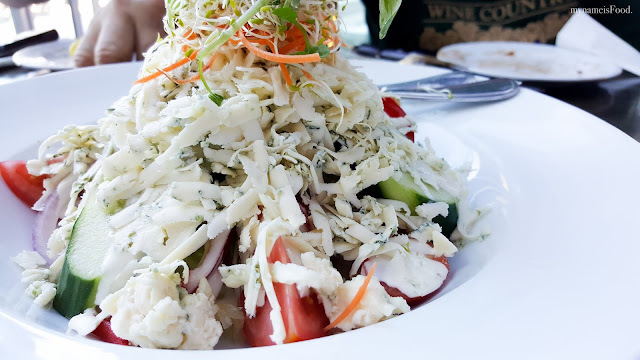 A refreshing salad and not-so-typical garden salad to have. The honey mustard dressing was very subtle but the green olives and the parmesan brings its flavour amongst it all. The thinly sliced pear was nicely executed as it was not too thick nor too thin until you could not taste the pear's flavour. By having only rocket leaves, allows everything to be well balanced without the bitterness of the other greens. 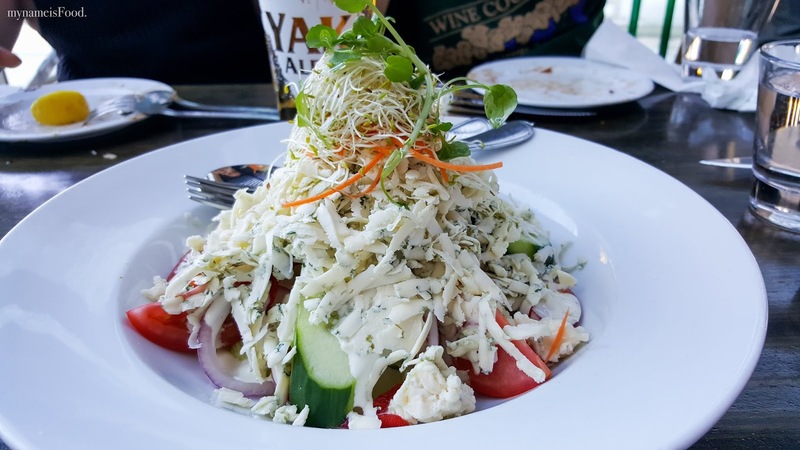 'Bluecheese salad' which consisted of iceberg, tomato, cucumber, capsicum, sprouts, carrot, Spanish onion, Danish blue with homemade blue cheese dressing. For those who's not so big on blue cheese, this may not be for you as for some, it may be a bit too strong. The chunks of tomato, cucumber and red onion gives it a real kick as well as a very fresh taste. The sprouts, iceberg and capsicum was also another compliment to the overall dish but definitely, the blue cheese would be the highlight of it all. No, the blue cheese does not melt but the soft texture reminded of the chewy mozarella cheese, with the punch of the blue cheese flavour, it enhances the whole dish through. 'Pork Ribs' served with chips was okay, it was not as consistent as the rest of the meat however, as some were off the bone, but some were slightly burnt and were not thoroughly cooked for long enough. The basting is not too sweet and was just right. It's interesting how when there's a big rack of ribs, you only get a handful of chips. Having more chips would've been good, as it won't be enough to share nor to probably keep you going through your ribs. 'Beef Burger' served with a side of chips or baked potato. 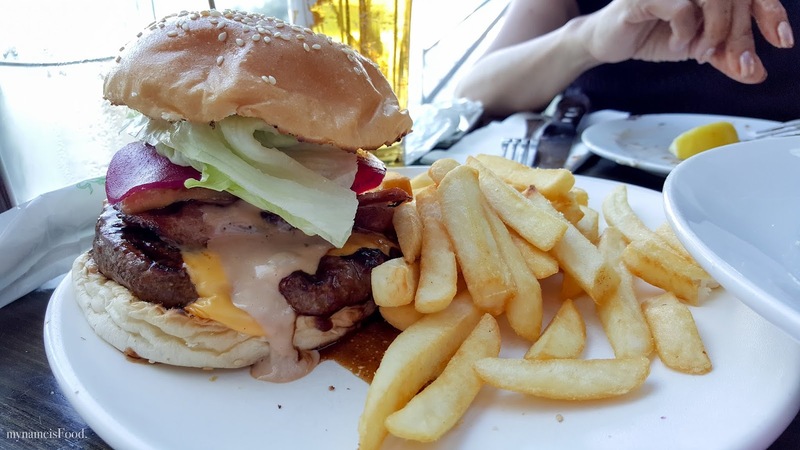 The beef patty was noted to be a Cape Grim, 100% Grass Fed beef served with tomato, lettuce, Spanish onion, pickles, thousand island dressing. It was not bad, but not the best. The thousand island dressing made the bottom bun soggy along with the juices of the beef patty oozing out as well as you can see above, between the burger and the chips itself. So, eating this would most likely be messy as you may just need to deconstruct it instead of picking it up with two hands and taking a big bite.